Wednesday’s decline took the value of the virtual currency down to about half what it was at its peak last month. SAN FRANCISCO — The air has been swiftly leaking out of the virtual-currency bubble. A decline in virtual-currency prices that began before Christmas has picked up pace in recent days as concern has grown that governments could crack down on the new industry. For a time on Wednesday, the price of bitcoin dipped below $10,000, taking it to about half what it was at its peak last month. The falling prices have been serious enough to prompt online posts with suicide hotlines for virtual- currency investors in despair. The declines are likely to be particularly painful for people who took out debt to buy virtual currencies at high prices. Even the lows hit on Wednesday are still well up — some 1,000 percent — from where bitcoin began 2017. But that is little comfort for the people who purchased late last year. The pessimism in recent days has been fed by several reports that governments around the world were planning to tighten the reins on virtual-currency trading. 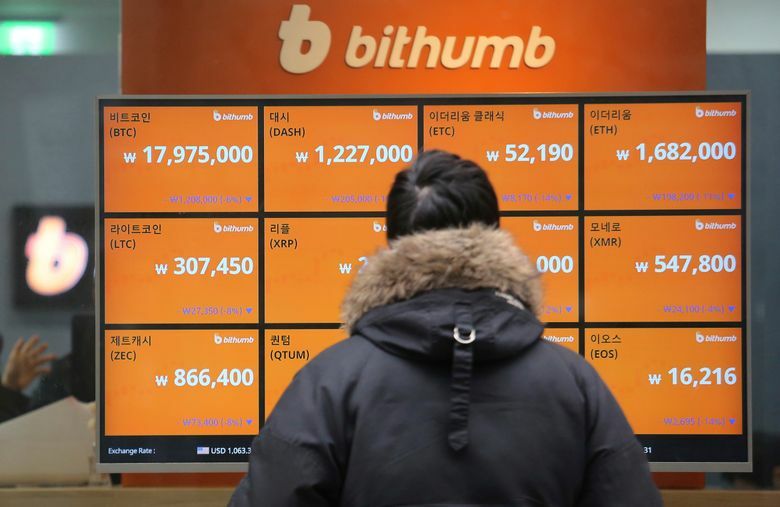 South Korean officials have said they were contemplating shutting down the virtual-currency exchanges that have popped up over the past year. South Korea has seen the most frenzied surge of ordinary investors throwing their savings into bitcoin and other digital tokens. Some longtime virtual- currency investors have said that a major price pullback was necessary after the hype had gotten so far ahead of the reality. Monica Quaintance, lead engineer at a company working on technology related to digital currencies and an organizer of events for women interested in them, said investors should expect price volatility until there is strong government regulation. “People want to know that if they make a lot of money from bitcoin they’re going to be able to keep the money,” Quaintance said. “The latest price falls suggest that the bubble is bursting — although with prices still ten times higher than a year ago, they have a lot further to fall yet,” Capital Economics wrote.